When four hijackers takeover an Air France jet en route from Tel Aviv to Paris on June 27, 1976, the 248 passengers aboard are unaware of the harrowing ordeal that awaits them. Forced at gunpoint to relinquish their passports, the terrified hostages comply with their captors’ demands, while discretely attempting to hide their identities. 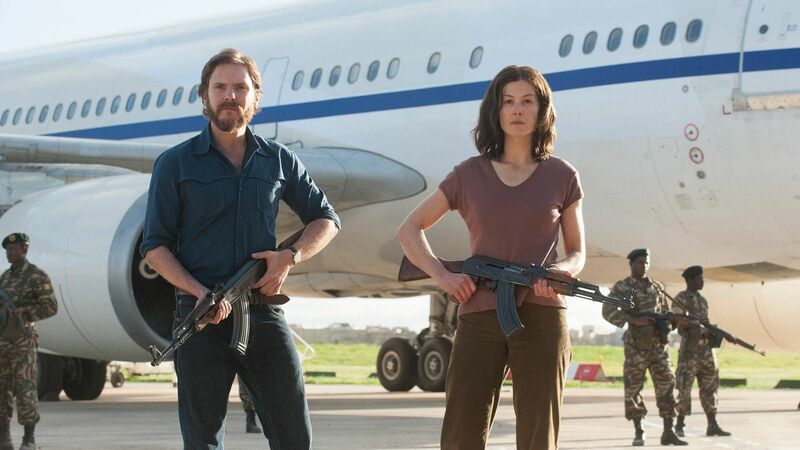 Two of the hijackers are Palestinian members of the radical Popular Front for the Liberation of Palestine – External Operations, while the other two, Wilfried Böse (Daniel Brühl) and Brigitte Kuhlmann (Rosamund Pike), are leftist German radicals sympathetic to the Palestinian cause. Meanwhile, in Jerusalem, Prime Minister Yitzhak Rabin (Lior Ashkenazi) receives word of the hijacking during a tense meeting about the country’s skyrocketing military budget. Quickly dismissing his cabinet, he and Defense Minister Shimon Peres (Eddie Marsan) debate what Israel’s response should be. Peres urges Rabin not to negotiate with the hijackers who are demanding $5 million dollars and the release of more than 50 pro-Palestinian militants imprisoned around the globe, and instead suggests a covert military solution. The hijacked plane is diverted to Entebbe Airport in Uganda, where it is met by the country’s notorious dictator, Idi Amin (Nonso Anozie). Held captive in an abandoned transit hall under the watchful eye of additional armed hijackers, the passengers are eventually divided by nationality, with Israelis put into a separate room. Under mounting pressure from the victims’ families, and with the threat of mass bloodshed should the hijackers ‘ demands go unmet, Rabin authorizes a daring rescue mission. Dubbed “Operation Thunderbolt,” the audacious plan requires split-second timing, the element of surprise, and cooperation from a neighboring country. As the deadline looms and tensions rise, an elite squadron of Israeli commandos race toward Entebbe in a daring and unprecedented attempt to free the hostages before it’s too late. Very suspenseful and wonderful acting!